Try this immersive, high-quality game for FREE! Then continue the adventure with a ONE TIME unlock and play offline! NO VIRTUAL ITEMS, NO INTERRUPTIONS… you’ll OWN this game for life. You thought this would be just like any other investigation. But now you find yourself lost in a mysterious mansion brimming with strange creatures, comatose colleagues, and mysterious tentacles around every corner! Can you find the source of the strange happenings and destroy it before it’s too late? • NOTHING IS AS IT SEEMS A local collector has been complaining about paranormal activity in her mansion and the authorities have called on you to get to the bottom of things. 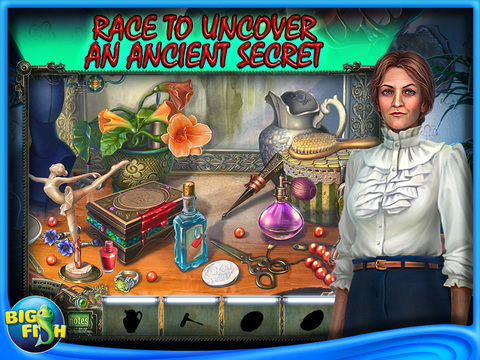 • RACE TO UNCOVER AN ANCIENT SECRET Use your special goggles to decipher secret code puzzles and mini games and search for hidden objects within strange dreamlike scenes! • INVESTIGATE THE THEFT OF A MAGICAL CRYSTAL SKULL A mysterious crystal skull belonging to the God of Dreams is wreaking havoc. Find a way to stop it and save your colleagues! • TRAVEL INTO THE MIND OF THE VILLAIN IN THE BONUS CHAPTER Collect animals for your personal zoo and various achievements along the way. Plus, enjoy extras like intriguing wallpapers and concept art! *** Discover more from Big Fish! *** Check out our entire game library with our Big Fish Games app absolutely FREE here: bigfi.sh/bigfishgamesapp Sign up for our newsletter and never miss a new release or promotion again: bigfi.sh/isplashnewsletter Big Fish is the leading global marketplace to discover and enjoy casual games. You can enjoy our virtually endless selection of games anytime, anywhere — on your PC, Mac, mobile phone, or tablet.